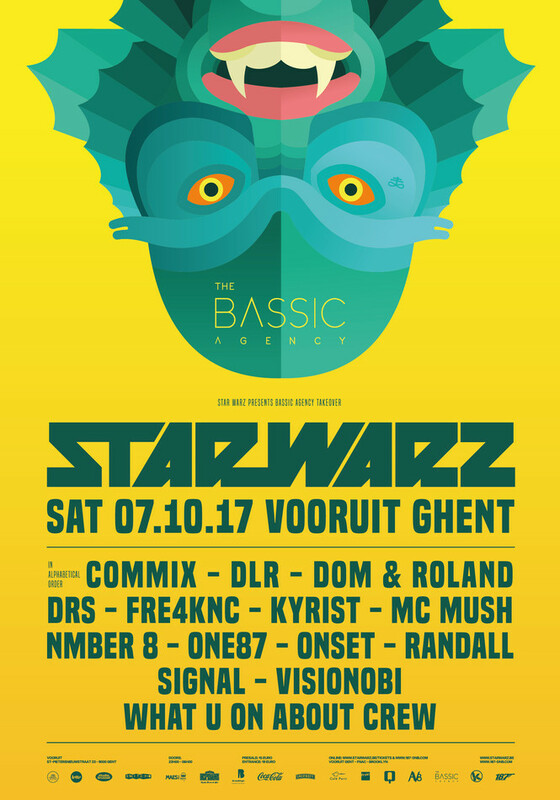 After Croatia’s Outlook Festival and a smashing stage at Tomorrowland 2017, Star Warz will be ready to return to The Vooruit on Saturday, October 7th. This time they will join forces with Bassic Agency UK and will present you a wicked line-up of no less than 14 artists on the bill. Expect to be blown away by both big guns & fresh talents at the next edition of Star Warz ! Commix is an essential household name in modern Drum ‘n’ Bass. With influences deeply rooted in techno, the legacy of Commix has spread far and wide. His debut album ‘Call To Mind’ (Metalheadz, 2007) is still regarded as one the genre’s best albums this century and the legendary track ‘Be True’ is still regularly played by Andy C, Friction & Goldie too. Following an appearance on Doc Scott’s ‘Future Beats’ album in late 2014, a new phase of Commix was launched with 3 come-back singles and a new album for Metalheadz in the making! DLR has been around pushing the sonic & technical boundaries of Drum ‘n’ Bass for some time now. His 2012 collaborative album with Octane 'Method in the Madness' set the bar for what was to come. After a string of singles, EP’s and remixes on established labels including: Symmetry Recordings, Utopia Music, Warm Communications & Metalheadz, 'Dispatch Recordings' presented DLR’s second album ‘Seeing Sounds’ in 2015 and his 3rd 'Dreamland' in 2016. That year he also launched his OneMind project with Mako, seeing them unveiling their live show and forthcoming album, this time releasing on the mighty ‘Metalheadz'. In late 2005, having fulfilled his commitment to Moving Shadow, Dom started his own record label ‘Dom and Roland Productions’ to release collaborations between himself and the crème de la crème of artists he had met and mingled with over the years. He has continued to DJ around the world to this day. With another 3 solo albums under his belt, on his own label, Dom signed his latest offerings to Goldie’s Metalheadz label. When Goldie was recently asked about his labels releases, he was quoted as saying “Dom’s new album…pfff well… it pretty much blows everything else away”..
As well as being an experienced and very talented DJ, Fre4knc has also built up his reputation as an innovative producer, releasing music on labels such as Critical, Dispatch, Samurai and Noisia’s Invisible. The Dutch man has also created and developed his own sound on the way, something that has earned him support from the likes of Noisia, Photek, Friction, DJ Hype and many more. 2017 sees Fre4knc take things to a new level as he continues to successfully push his infectious sound whilst preparing new releases for both Dispatch and Invisible. Over the last few years Kyrist has built up a reputation for her trademark style which mainly focuses on the darker and more tech-driven side of Drum ‘n’ Bass, and in the process has seen her tunes included in the sets of some of the scenes most respected DJ's. Labels such as Proximity, Nurtured Beatz, Vandal, Dutty Audio and of course Dispatch have been the foundation of Kyrist's success, and releases on those imprints coupled with her razor sharp mixing skills are the reason why she's so highly rated and heavily tipped as one for the future. Deep perception, meaningful lyrics and real love for the music, perfectly summarize what MC Mush is all about. Focusing on quality control has always been his main drive. By lending his voice and rhymes too various DJ's and party concepts for over a decade, MC Mush has steadily been making name for himself with underground ravers and the Drum 'n' Bass public, both in Belgium and abroad. Steam, Liquid flavaz radio and of course Star Warz are but a few of many concepts that Mush was able to grace with his rhymes. Nowadays he 's working closely together with One87 as his MC of choice, always careful to complement and never overpower the music. Obviously, One87, Star Warz resident is also present. He played over a thousand national & international dj sets, on all kinds of events, alongside most of the great names in Drum ‘n’ Bass today. Highlights include sets at Metalheadz @ Fabric and Cable in London, Shogun Audio @ Cable in London, Dour, Pukkelpop and Tomorrowland in Belgium, USA and Brasil. As well as his own Star Warz events! Onset has developed his passion for Drum ‘n’ Bass through years of hard graft. Since co-founding the night ‘Fullfat’ in 2011, residencies soon followed at Subdub, Vagabondz, Central Beatz and most importantly, Ant TC1’s own, Momentum. Now working at The Bassic Agency and Dispatch Recordings, he has since moved to Bristol, setting up Collective with some of the city's finest selectors. Performing across the UK (including Fabric in London) and Europe, he is also a regular at Croatia’s Outlook Festival. Setting the pace in Jungle / D&B from day dot, Randall is the quintessential ‘DJs DJ’. A legend within all corners of the industry, cited as a major inspiration to the likes of Andy C, he is respected universally, for his impeccable selection and faultless mixing talent, remaining heavily in demand to this day.With his own music featuring on Reinforced and Ram Records (see ‘Sound Control’ with Andy C), he runs his own Mac II Recordings imprint today. Keeping on the pulse of underground talent, the label is testament to his infamous selection. Not many producers can say they’ve signed music to Critical Music, Renegade Hardware and Noisia’s Invisible Recordings in their first year of making Drum ‘n’ Bass. In late 2015 Signal introduced DJing to his long list of talents, followed by appearances on Critical, Bad Taste, Dispatch, Cyberfunk, Neodigital before winning the coveted ‘Best Newcomer’ award at the Drum & Bass Arena Awards. 2017 started with an influx of high profile bookings and a list of forthcoming releases so long it stretches beyond imagination. Amongst his forthcoming material lies a ton of collaborations with some of the biggest names including SpectraSoul, Icicle, Teddy Killerz, Emperor, Phace, Neonlight and Joe Ford as well a remix for RAM heavyweights Camo & Krooked. Since first picking up a microphone, Visionobi has hosted for the likes of Metalheadz, Hospital, Ram, Dispatch, Critical, Shogun, Spearhead, Symmetry, UKF, Drum&Bass Arena, Exit, Soul:ution, CIA, FabricLive, Soul:vent as well as a plethora of festival brands and established promoters, whilst regularly hosting shows on Rinse FM and D&BTV. 2015 saw his first official release on Dispatch Recordings, whilst 2016 has seen his vocals showcased on Metalheadz & Siren Audio. The future looks bright with releases on Metalheadz, Dispatch & Horizons and on Cyberfunk & Shogun potentially coming to fruition. What-u-on-about!? is a Louvain based quality Drum'n' Bass concept organized by Tesla (Star Warz, Isle of DNB), Speedwagon (Pukkelpop, Tomorrowland), Fuzz (Tomorrowland, Der Machine) and MC Mota (Rampage, Hospitality). On a regular basis they come up with a funky fresh Drum 'n 'Bass line up with residents and guestdj's including Skeptical, Total Science, LSB, Technimatic, Nymfo and loads of crazy Belgians. Quality Drum 'n' Bass, big vibes, friendly atmosphere and dreadful hangovers are their keywords. One of the biggest Star Warz nights ever … if you’re a true Drum ‘n’ Bass fan, you will be there!